He says Robert Gates discusses Pakistan, Iraq and more on "Fareed Zakaria GPS"
Fareed Zakaria says that for Pakistan, fighting the Taliban is more complex than fighting a cold war with India. (CNN) -- Pakistan's military struck back this week at militants in Taliban-held areas. The military operation has resulted in more than 230 militant casualties since Sunday, while the military suffered two deaths and eight injuries, according to Maj. Gen. Athar Abbas, a military spokesman. Pakistan has asked the United States to supply its forces with helicopters, communication equipment and night vision technology, Abbas said. The operation is part of the Pakistani army's intensified drive against the Taliban in its restive tribal regions. The Pakistani government has been criticized for not cracking down on militants along its border with Afghanistan. As a result, the U.S. military has carried out airstrikes against militant targets in Pakistan, which have rankled relations between the two countries. Fareed Zakaria, whose show Sunday will include an interview with U.S. Defense Secretary Robert Gates, spoke with CNN about the Pakistan insurgency. CNN: It seems the Pakistani military is finally responding to the Taliban threat. Defense Secretary Robert Gates goes one-on-one with Fareed Zakaria on "GPS"
Fareed Zakaria: Yes. This past week, we've seen a more aggressive Pakistani military response to the Taliban, especially in the Buner district and the Swat Valley. CNN: What has caused the shift? Zakaria: The collapse of the peace deal that the Pakistani government made in Swat seems to have been a wake-up call. The Pakistani military has come to understand the threat the Taliban poses to the stability of their country. I say this with some hesitation because it might not be a permanent shift, but so far, so good. CNN: But it is so obvious. Why didn't they get it before? Zakaria: The Pakistani military has been in a state of denial. It spends most of its time, energy and resources planning for a war against India, a war on its eastern frontier. That's the war they know and are comfortable with -- a big conventional deployment. And for the last three decades, by seeing India as the enemy, the military could get big budgets -- they had a much larger enemy -- but also know that there is actually only a small possibility of a war. Fighting the Taliban is a much more complicated guerrilla war against a complex insurgency. First of all, you actually have to fight this war, as opposed to the cold war with India. Secondly, if you fight it, you can lose. So, they have been trying their best not to deal with this. That's what the peace deals were all about, trying to finesse their way out of the situation. But this is now the moment of truth for the Pakistani military. CNN: Are they equipped to deal with the Taliban? Zakaria: If you mean, "Do they know how to do counterinsurgency?" No. Again, their whole training has been to fight a war against India. And they have not really wanted to embrace this role of counterinsurgency warfare. This is messy stuff, as we learned in Iraq. CNN: Anything we can do? Zakaria: Force the Pakistani military to reorient their basic strategy to recognize that these jihadi groups are the existential threat to their existence. We give the Pakistanis a huge amount of aid, both military and civilian. The military always wants more. Pakistan's ambassador to the United States, Husain Haqqani, wrote in The Wall Street Journal, "We need the U.S. to share modern technology in antiterrorist engagement. Pakistan needs night-vision equipment, jammers that can knock out FM radio transmissions by the terrorists, and a larger, modernized fleet of helicopter gunships for ground support in the massive sweeps that are necessary to contain, repel and destroy the enemy." He goes on to indicate the United States has not been helpful. "Yet Washington has been reluctant to share this modern equipment, and to train our military in anti-terrorism techniques, because of concerns that these systems could be used against India. Such concerns are misplaced. Pakistanis understand that the primary threat to our homeland today is not from our neighbor to the east but from the Federally Administered Tribal Areas (FATA) on our border with Afghanistan." CNN: Well it seems they are saying the right things. Why don't we provide them what they need? CNN: So Secretary Gates thinks there has been a change in attitude within the Pakistani military? 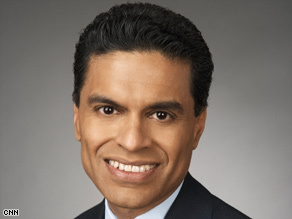 Zakaria: I would say from our conversation, yes. He even compared Pakistan's evolution towards recognizing the threat from the Taliban with the United States' process of recognizing the threat posed by al Qaeda to its security. You should watch "Fareed Zakaria GPS" this Sunday to hear his explanation. He also discusses Afghanistan, nuclear weapons, Iraq and much more. It's a fascinating conversation, and you shouldn't miss it.